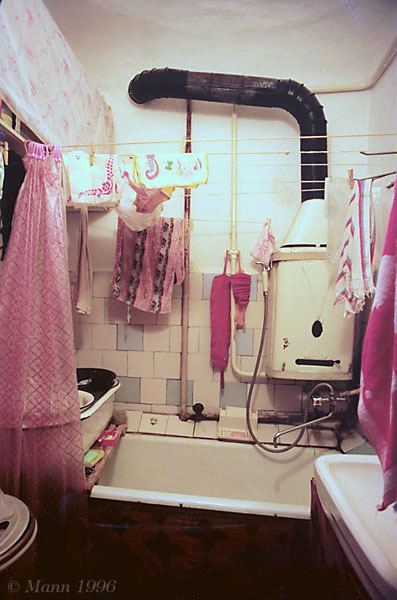 This is a photograph of a typical Russian bath tub in one of the apartments in Volgograd. Mounted on the wall behind it, is a gas water heater. To get hot water, one must turn on the water and light the gas burner in the heater. The water runs through a coil of pipes that are heated by the burner. This supplies hot water to the kitchen also. When finished, one must first shut off the burner and then shut off the water. There is no hot water reservoir (hot water tank) like in most American facilities. Notice the clothes drying lines over the tub. Most of the laundry is done by hand in the bath tub and hung up to dry on these lines. In the summer, laundry can be hung outside on the balcony.